CA Corona Ave. MA Manhattan Av. CS Crescent Street NA Nassau Av. FHP Fort Hamilton Park Ne Neptune Av. HA Hegeman Av. TA Tilden Av. A Westchester Av. The Hub - Westchester Av. - Westchester Sq. L St. Ann's Ave. Mott Haven - St. Ann's Ave. - E 161st St. Se* Sedgwick Av. Sedgwick Av. - Burnside Av. - Tremont Av. - 3rd Av. VW* Williamsbridge 3rd Av. - Tremont Av. - West Farms Sq. - Morris Park Av. - White Plains Rd. - E Gun Hill Rd. * Some lines shared their letter designations (B, S, T, V). In these cases, I added a second letter for clarity. ** There was one crosstown line designated with the letter X. 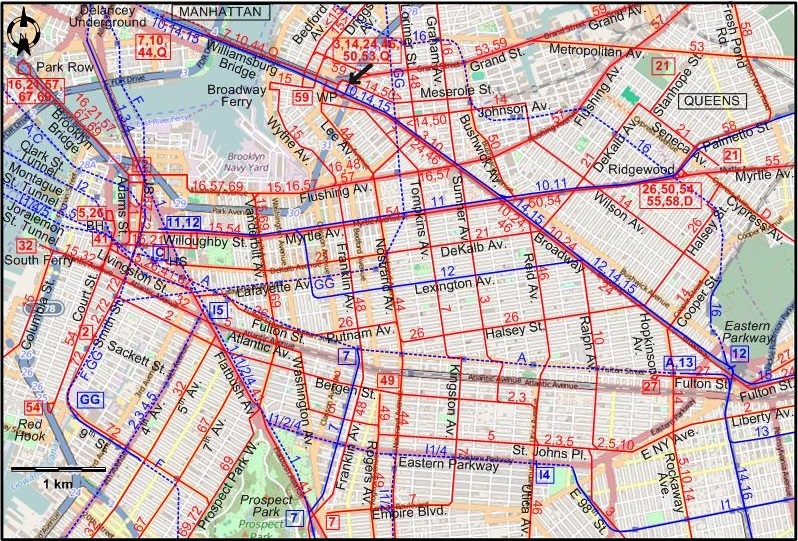 For clarity, I added 138 to it (since it was also known as the 138th Street line). 2 Bergen St. Sackett St. - Smith St. - Bergen St. - St. Johns Pl. - Liberty Av. - Sheridan Av. 3 Sumner Ave. Williamsburg Plaza - Broadway - Sumner Av. (Marcus Garvey Blvd.) - St. Johns Pl. - Hegeman Av. 5 St Johns Place Borough Hall - Livingston St. - Atlantic Av. - Washington Av. - St Johns Place - Rockaway Ave. - Hegeman Av. 8 Church Av. 39th St. Ferry - 39th St. - Church Av. - Hegeman Av. 10 Ralph & Rockaway Avenues Delancey Underground (Manhattan) - Williamsburg Bridge - Williamsburg Plaza - Broadway - Ralph Av. - E New York Av. - Rockaway Ave. - Hegeman Av. 13 Gravesend & Church Avenues Long Island RR Interchange - MacDonald Av. - Church Av. - Hegeman Av. 14 Wilson Av. Williamsburg Plaza - Meserole St. [back: Johnson Av. - Broadway] - Johnson Av. - Wilson Av. - Cooper St. - Rockaway Ave. - Hegeman Av. 30 Eighth Av. 39th St. Ferry - 39th St. - 8th Av. - Bay Ridge Av. 48 Lorimer St. Varick Av. - Nassau Av. - Lorimer St. - Flushing Av. - Franklin Av. - Prospect Park - Church Av. 53 Metropolitan Av. Williamsburg Plaza - Grand St. - Metropolitan Av. - Jamaica Av. 55 Richmond Hill Ridgewood (Queens) - Myrtle Av. - Jamaica Av. 67 Seventh Av. Park Row (Manhattan) - Brooklyn Bridge - Joyce St. - Livingston St. - Flatbush Av. - 7th Av. - Greenwood Cem. 72 Smith St. Brooklyn Bridge - Joyce St. - Smith St. - 9th St. - Prospect Park W. - Greenwood Cem. B Broadway First Av. - 42nd St. - Times Sq. - Broadway - Amsterdam Av. - W 129th St.
T Third & Amsterdam Av. Park Row - Bowery - Third Av. - 125th St. - Amsterdam Av. - 190th St.
X59 59th St. Crosstown Queensboro Bridge - 59th St. - Tenth Av. - 54th St. Note: Crosstown routes were simply designated as X. The designations X42, X59 and X125 are used for clarity. Note: The QB designation above is for clarity, and was not used by the operator. 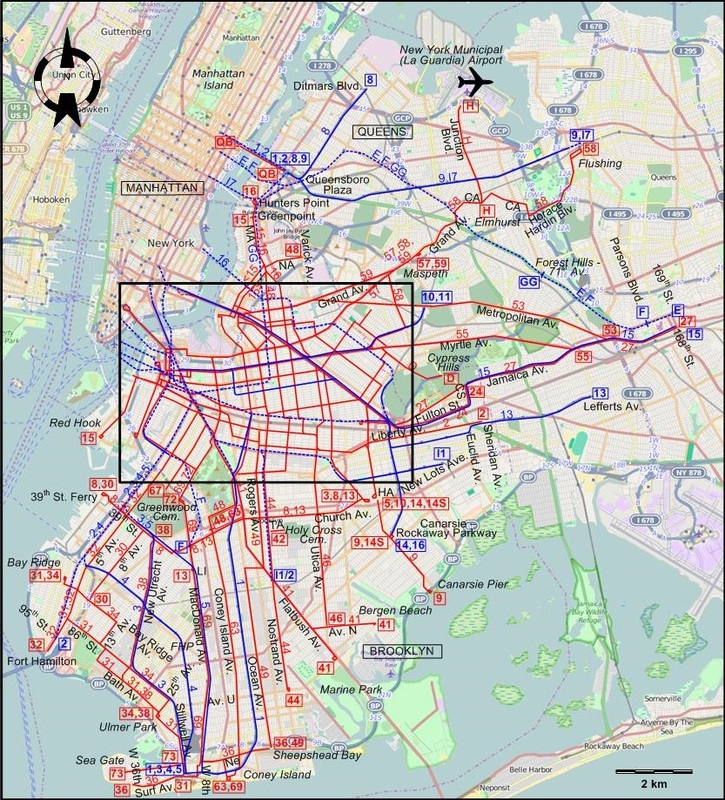 Note: Subway routes in New York City sometimes varied in function of the day of the week, time of day and other factors. In the list below, I tried to present the normal weekday operation for each route. Line numbers (in the first column) are those used by the operator in 1946. Letters (in the second column) indicate the letters used today for the same (or similar) route in the New York City transit system. Single-lettered lines were express (at least partly), while double-lettered lines were always local (i.e. stopping at all stations). IRT Line indicators (I1 etc.) as given above are for clarity, and were not used by the operator. The number part tends to correspond to their number designation today, which are given in the second column. Horse-drawn streetcars: (Manhattan & The Bronx) 1853 - 1899; (Brooklyn) 3 July 1854 - 1893. 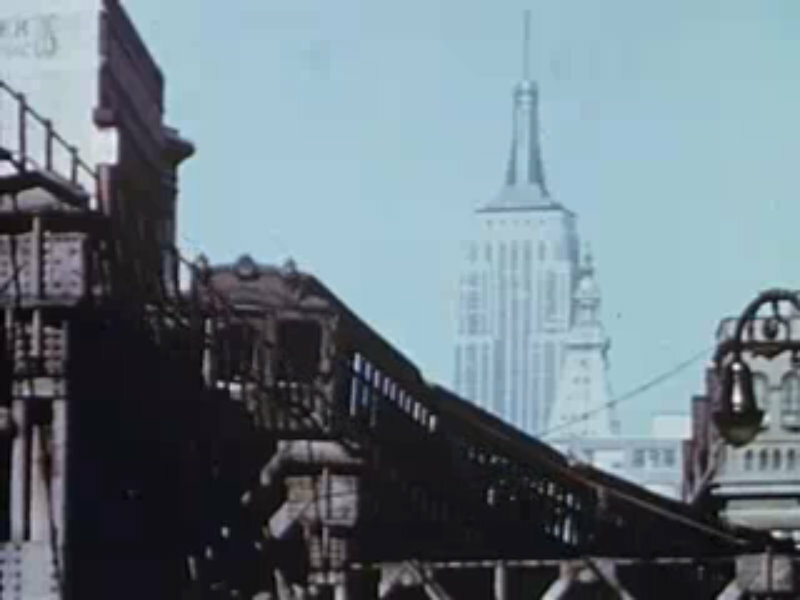 Electric streetcars (Manhattan, conduit system): 1899 - 1 July 1947. 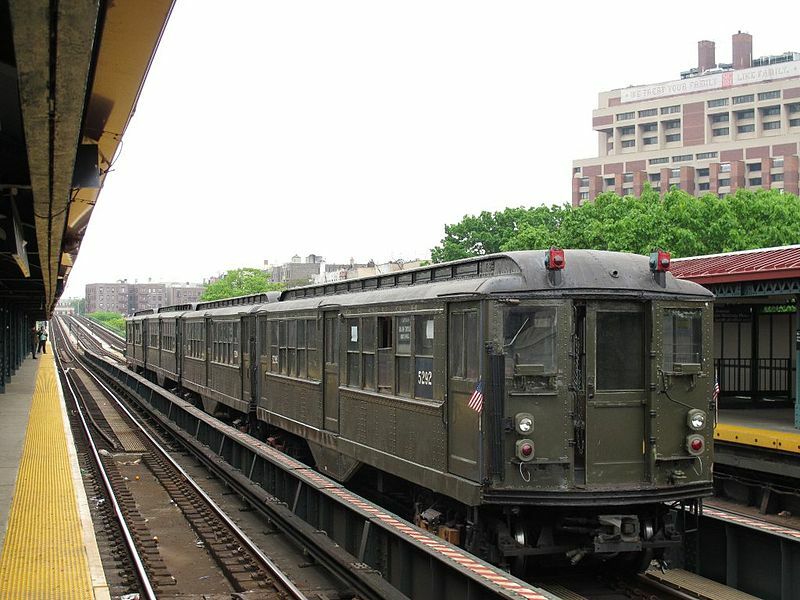 Electric streetcars (The Bronx) 1899 - 21 Aug. 1948 ; (Brooklyn and Queens): 1893 - 31 Oct. 1956. 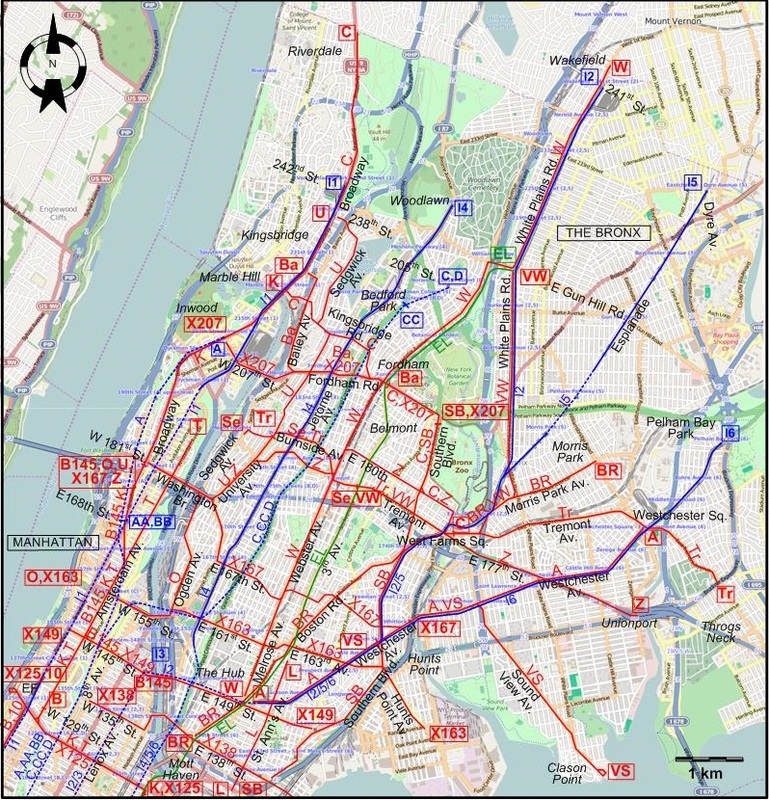 Queensborough Bridge Railway: 1909 - 7 Apr. 1957. Subway: 27 Oct. 1904 (but first overground component of the later subway system: 8 June 1864 - ) - today. Elevated railway (Manhattan & Bronx): 1 July 1868 - Apr. 1973. Subways & Elevated lines: 1435 mm. 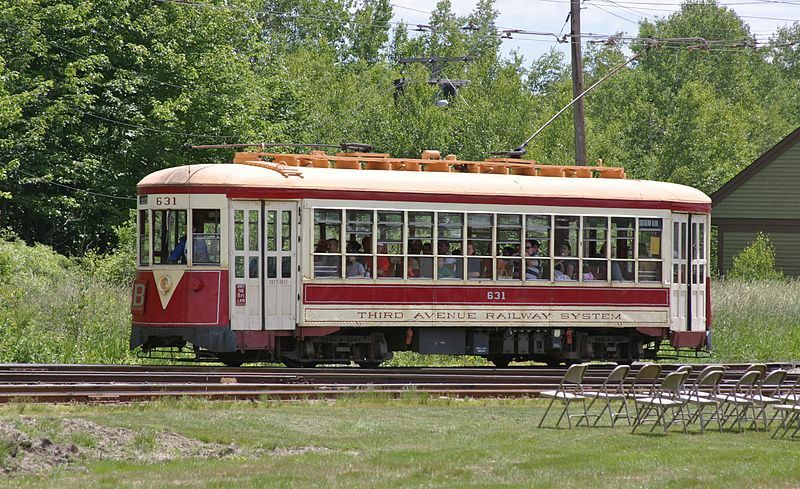 The Trolley Museum of New York (in Kingston NY, 146 km north of New York City in the Hudson Valley) runs heritage stretcars in the summer season on ca. 25 km of track. Track map of Brooklyn, Surface Lines Division, N.Y City Transit System Hoboken, NJ: Electric Railroaders Association, 1946 (reissued 1950). 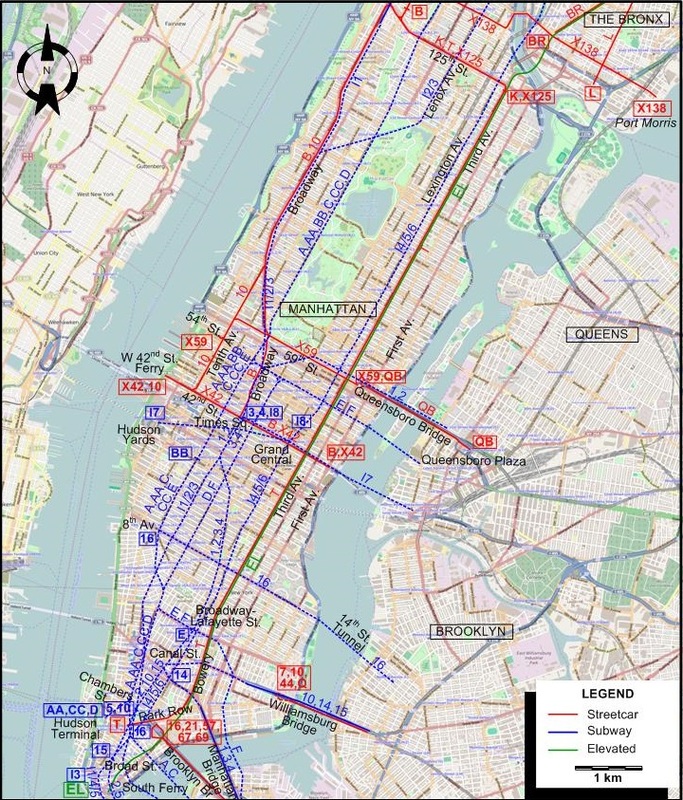 Trackage map, Third Avenue Transit System: Lines in Manhattan below 125th Street Hoboken, NJ: Electric Railroaders Association, 1946. Trackage map, Third Avenue Transit System: Lines in Upper Manhattan and the Bronx Hoboken, NJ: Electric Railroaders Association, 1946. Volkmer, W.D. New York City Trolleys in Color Flemington, NJ: Morning Sun Books, 2002. Special thanks to Bob Townley of Fairfield, CA for supplying me with much of the material used for the creation of this page, and for his kind suggestions for improving it. Special thanks also to Russell Powers for information on the Queensboro railway.